what a cute little loaf! thank you so much for baking with me, anne! I seriously thought about apple chunks in this one. Glad to know it works. I went with banana and chocolate chip muffins. Anyway you cut it, these are yummy! I agree with Susan--apple was a good idea! s right up my alley, I wish I could get my toddler to try my baking! Great adaptation with the apples. I love the mini loaves. This was definitely a keeper! Gotta love the mini loaves!! The apple sounds tasty! 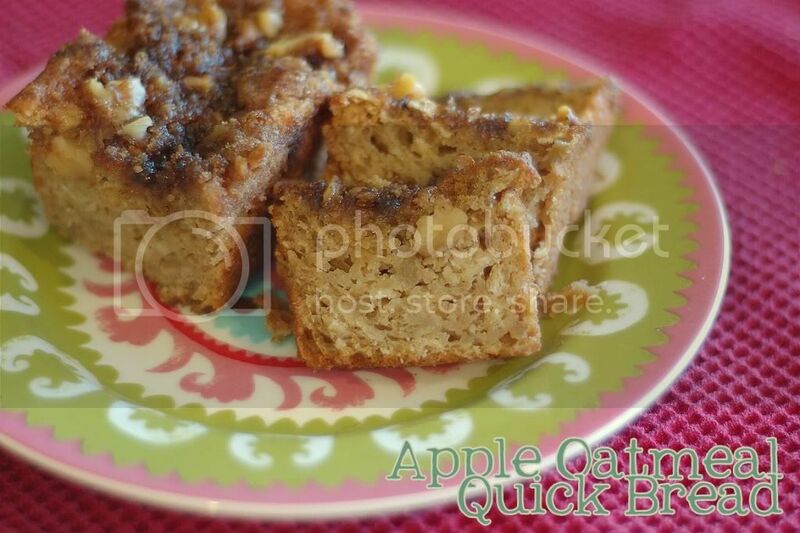 They look lovely as mini loaves, and apple chunks sound like a great addition. Mini loaves are uber cute! I have to invest in one soon :) Great variation! Ahhhh! So Sweet! Love the special mini-loaf for your little girl. Diced apples do sound delicious. We loved this recipe. So cute and great idea to use apple! Adorable little loaves. And how sweet to make one for your baby. Mine is eating nuts now, so he just shoved a muffin in his mouth. And I think this would be the perfect recipe to sneak in a little whole wheat flour - maybe next time! The second time I made it I used half apple sauce and and mashed banana. Great flavour. Wait, wouldn't everyone subsist solely on carbs if given the choice? Hmmm just me? Your mini loaf is super cute! And apple was a great idea! Looks really, really tasty, Anne. And the apple substitution is a great one. Yummy! I made this twice. Once as written, but in an 8x8 pan as coffee cake. And again subbing banana for the applesauce and adding lots of chocolate. GOOD! Glad you found another carb for your man. Looks so good. I've been looking for something to do with my apples! that looks like a super scrummy loaf-- i wish i had a piece! i think i forgot to say it in my blog post, but i swapped in a bit of whole wheat, and it worked super well here. Love the idea of the apples. I bet the one for Baby Strawberry was cute.